(Nanowerk News) Researchers developed a versatile, fully integrated microfluidic test-bed to facilitate the evaluation of new catalysts and materials for electrochemical energy conversion systems without the need for expensive scale-up. With its small size and adaptability, the test-bed can expedite the discovery and optimization of new artificial photosynthesis and fuel cell technologies ("Integrated microfluidic test-bed for energy conversion devices"). As all functional components in this microfluidic test-bed can be easily exchanged, the performance of various components in the integrated system can be quickly assessed and tailored for optimization. 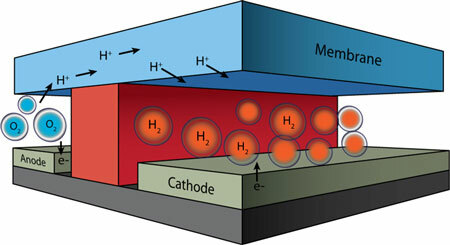 The initial experiments and modeling were performed for water electrolysis; however, the system can be readily adapted to study proposed artificial photosynthesis and fuel cell technologies. A major challenge in developing technologies to convert solar energy into electricity or electrochemical energy is finding an efficient way to test newly created device components. It is important to evaluate the small amounts of molecules and materials that are typically made in research laboratories before investing the effort to make enough for a full-scale device. Researchers at the Joint Center for Artificial Photosynthesis, an Energy Innovation Hub, developed a novel microfluidic approach for the fabrication and evaluation of integrated electrochemical energy conversion devices. Micro-fluidic electrochemical devices provide a simple route to integrate multiple components at small scales using a system architecture that can be easily tuned. Computer-based modeling tools concurrently developed allow researchers to further improve the overall device by gaining insight into individual component behaviors. The “plug-and-play” microfluidic technology developed here can be readily extended to other energy conversion systems such as solar-fuel generators and fuel cells, allowing facile testing of new components without the need for scale-up. The ability to conduct an early-stage assessment of the device’s operational performance under relevant conditions may significantly accelerate development of novel, efficient components with applications in artificial photosynthesis, electrolysis, and fuel cells.